The essential problem in Cellular Manufacturing System (CMS) is to identify the machine cells and subsequent part families with an aim to curtail the intercell and intracell traffic, known as Cell Formation Problem (CFP). 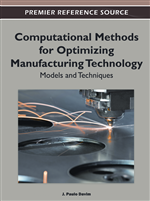 This chapter portrays the need of soft-computing methods to model the CFP to attain enhanced solutions. The novelty of this chapter is in developing a hybrid state-of-the-art metaheuristic approach, namely SAHCF (Simulated Annealing Heuristic to Cell Formation), to solve the binary CFP, and further, a Fuzzy-ART based hybrid technique is framed to solve the generalized CFP using operational time. The proposed techniques are tested on the test datasets published in the past literature. Both the techniques are shown to outperform the published methods available in literature and attained enhanced results by exceeding the solution quality on the test problems. The originality of this study lies in designing simple and efficient methodologies to produce near optimal solutions for the shop-floor managers with minimum computing abilities and time. Cellular Manufacturing (CM) is adopted as a strategic approach to embed flexibility and efficiency in the design of productive systems in industrial enterprises which can eventually decompose the entire system into several subsystems (Burbidge, 1963). The overall Cellular Manufacturing System (CMS) is characterized as a hybrid system combining the advantages of both the jobbing (flexibility) and mass (efficient flow and high production rate) production approaches. Therefore, cellular manufacturing is a solution to the efficient batch type with low setup time to produce variety of part types, shorter lead time and higher machine utilization with superior quality (Won & Currie, 2007). Group technology (GT) is defined as a manufacturing philosophy in which similar parts are identified and grouped together to take advantage of the similarities in manufacturing and design. GT is applied in CM as an alternative of traditional manufacturing system. Designing the manufacturing cell, usually referred to as 'Cell Formation Problem' (CF/CFP) which consists of the following approaches (Selim, Askin, & Vakharia, 1998): similar parts are normally grouped into part families according to their processing requirements, while machines are grouped into machine cells and subsequent part families are allocated to the respective machine cells. According to the available literature, three solution approaches can be identified in CMS (Papaioannou & Wilson, 2010): (a) part families are accomplished first and hence machines are clustered into cells according to the processing requirement of part families, known as part-family identification, (b) manufacturing cells (clustering of heterogeneous machines) are first generated based on uniformities in part routing and then the part families are allocated to cells, known as machine groups identification, (c) part families and machine cells are formed concurrently, which is known as Machine-Part Grouping Method (MPGM). It has been reported that employing CM may help overcome major problems of batch-type manufacturing including frequent setups, excessive in-process inventories, long through-put times, complex planning and control functions, and provides the basis for implementation of manufacturing techniques such as just-in-time (JIT) and flexible manufacturing systems (FMS) (Seifoddini, 1989). Implementation of CMS contains various aspects such as human, education, environment, technology, organization, management, evaluation and even culture. Burbidge, Falster, and Rhs (1991), Beatty (1992), and Sevier (1992) reported on the human aspect in CM. Aspects involved in implementing the CM systems can be obtained from Silveira (1999), Wemmerlöv and Johnson (1997; 2000). Despite the fact that there have been large number of solution methodologies proposed by researchers since early 80s to solve cell formation problem, such as mathematical programming, graph theory, exact methods, heuristics, meta-heuristic methods and artificial intelligent techniques such as neural network or fuzzy set theory, the clear research trend in literature of cell formation problem manifests a direction towards soft-computing methodologies due to its strong nature of convergence to attain optimal solutions (Papaioannou & Wilson, 2010). Artificial Neural Networks and meta-heuristic based techniques are the frequently adopted techniques of this class, being employed by researchers in cell formation problem in search of quick and better solution. Artificial Neural Network (ANN) is also called connectionist model, neural net, or parallel distributed processor (PDP) model as reported by Odejobi and Umoru (2009). Artificial neural networks are massively parallel computer algorithms with an ability to learn from experience (Wasserman, 1989). They have the capability to generalize, adapt, approximate the new information, and provide reliable classifications of data.